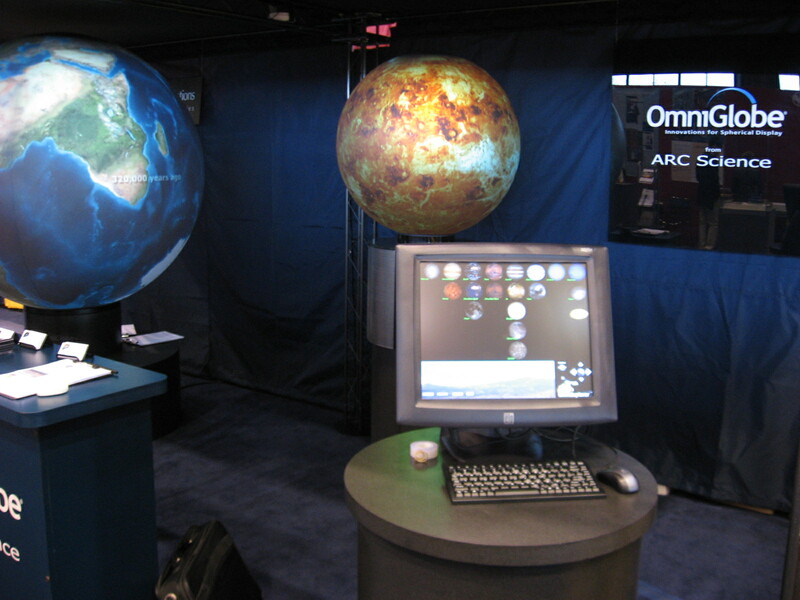 Системы OmniGlobe® характеризуются внутренним проецированием: в установке используются один или два проектора, изображение с которых передается через отверстие в верхней или нижней части глобуса на оптическую систему, а затем проецируется через нее на сферический экран из акрилового стекла со специальным покрытием. 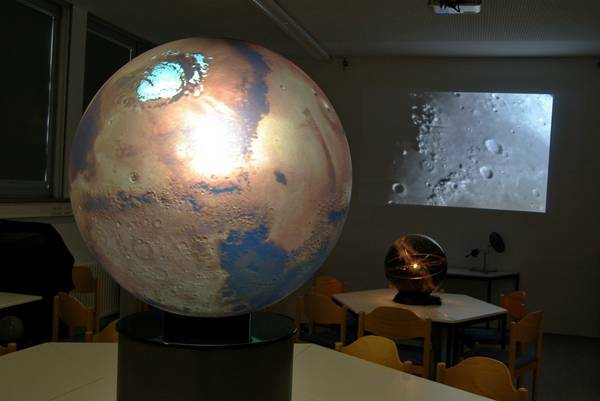 Оптическая система состоит из выпуклых зеркал, изготовленных по патентированной технологии. 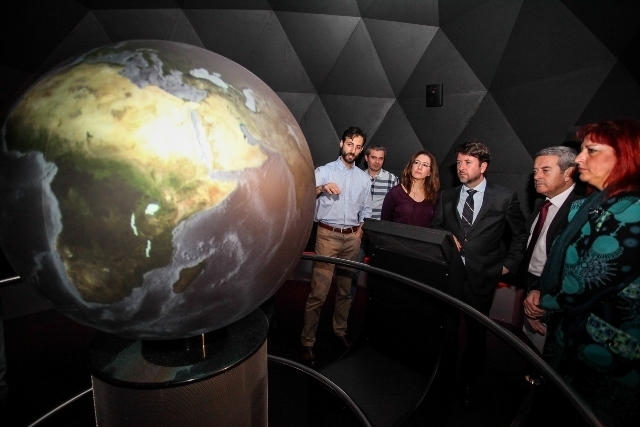 Системы Science On a Sphere® включают в себя четыре проектора, устанавливаемых вдоль линии экватора. 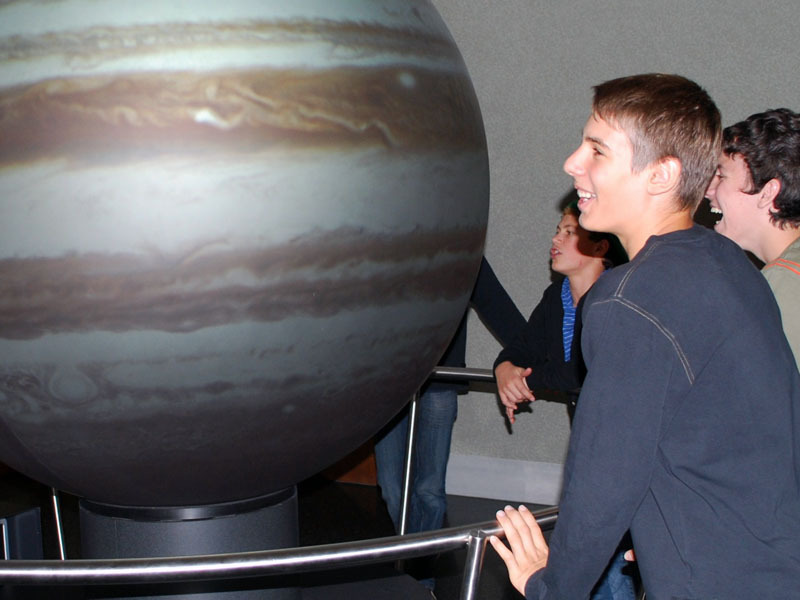 В зависимости от места нахождения зрителей и характера выставочного помещения наших заказчиков систему можно расширить еще двумя проекторами, располагающимися в районе полюсов глобуса. 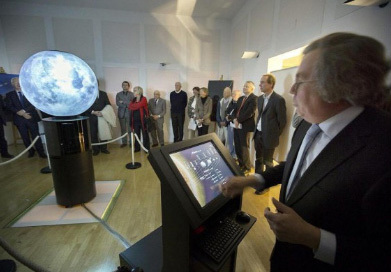 The Joint Research Center in Ispra (Italy) uses the OmniGlobe® to present their latest research results to the general public. 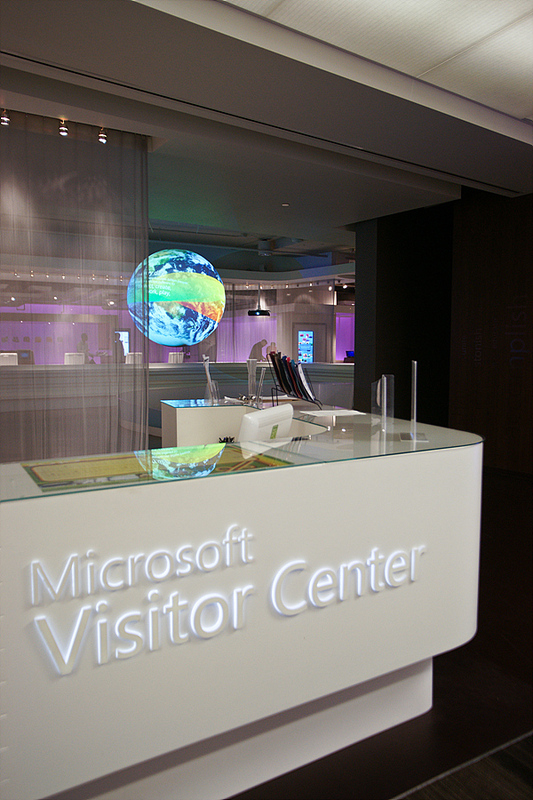 Visit the new visitor center in Ispra. 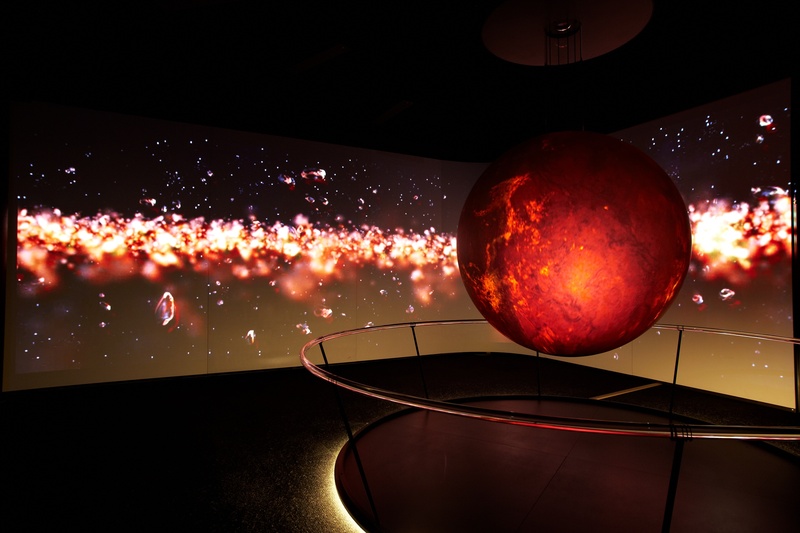 As a highlight of the focusTerra museum at ETH Zürich the OmniGlobe® to interactively visualize dynamic processes such as plate tectonics, climate change, terrestrial magnetism, or the surface of other planetary bodies. 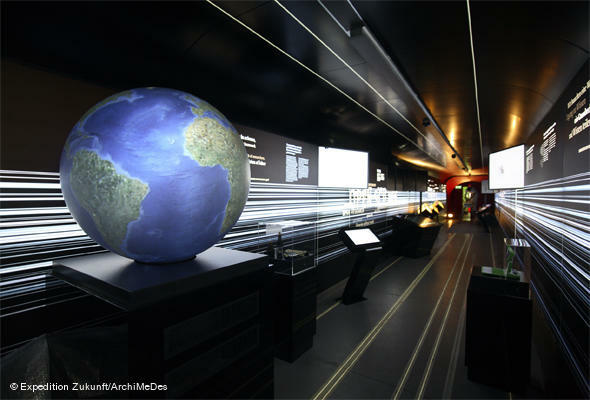 The Max Planck Science Tunnel - touring exhibition over all Europe, addresses the megatrends of the 21st century. 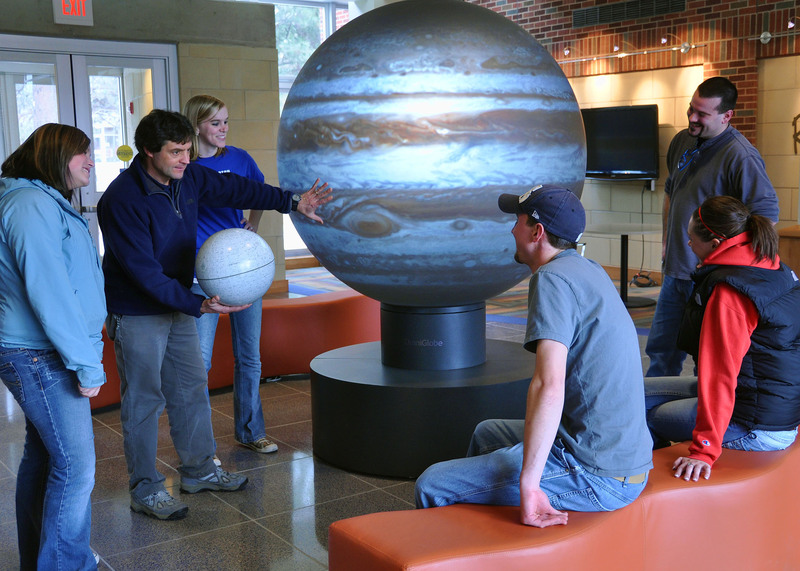 It takes you on a journey through the major issues of basic research, from the origins of space, the idiosyncrasies of the wonder that is the brain, to the vision of sustainable energy supplies. 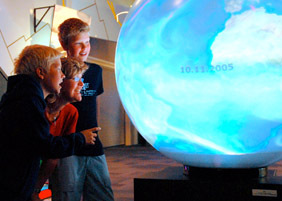 The Climate Globe shows. 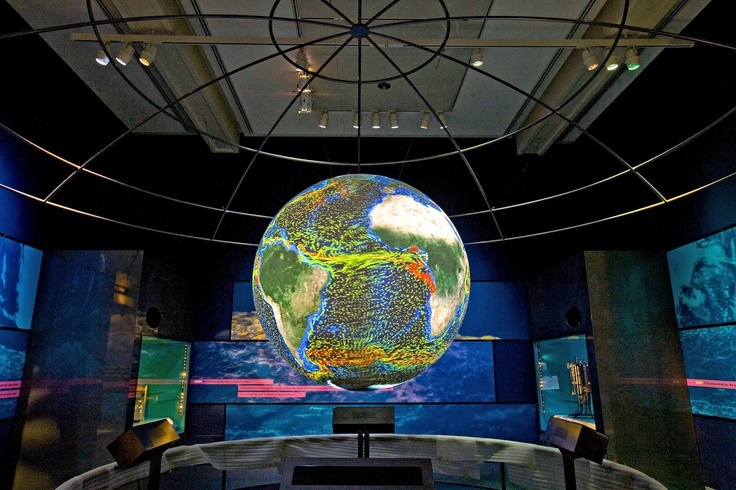 Results from climate simulations are regularly shown to the public on the occasions of conferences, exhibits or other events, like the Climate Weeks in Hamburg or the EXPO in Shanghai. 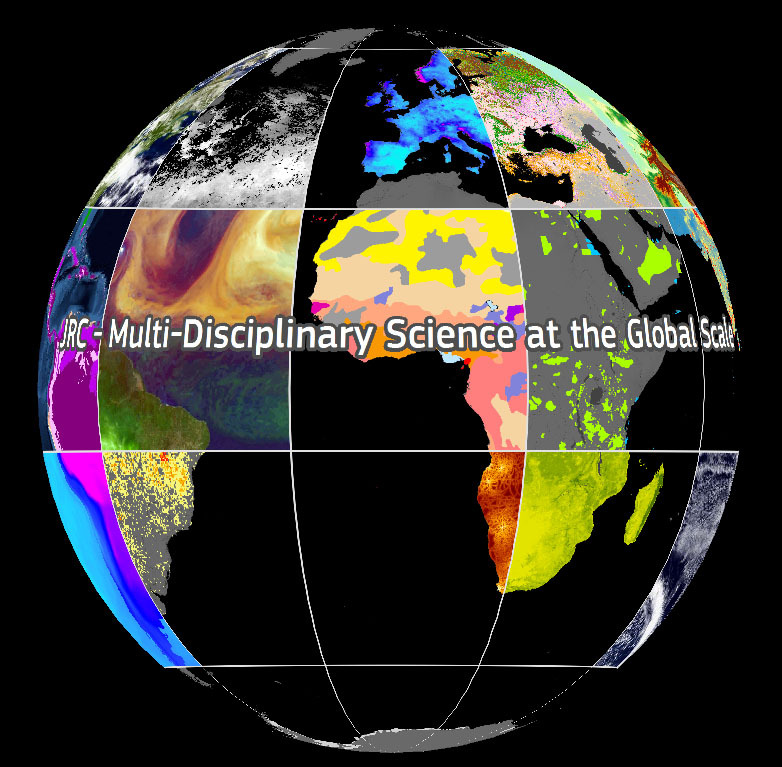 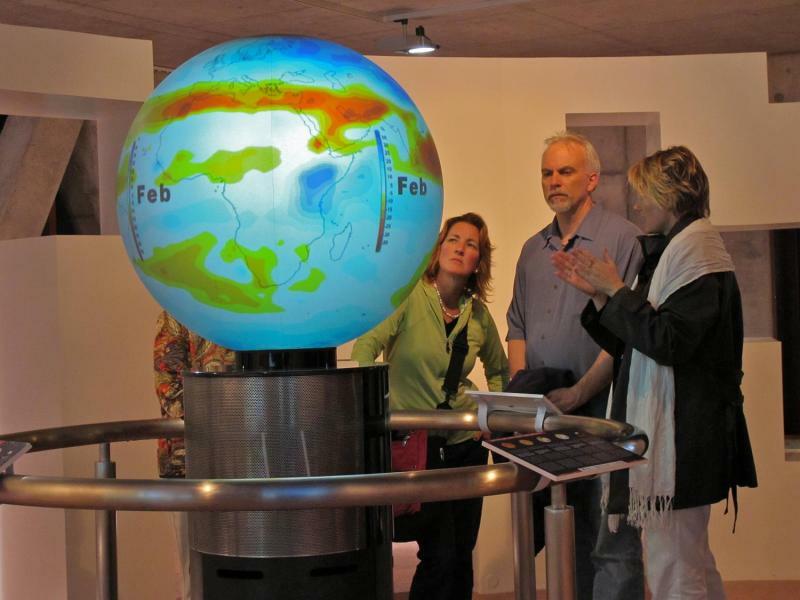 The Climate Globe is jointly operated by the Climate Service Center 2.0 and the DKRZ. 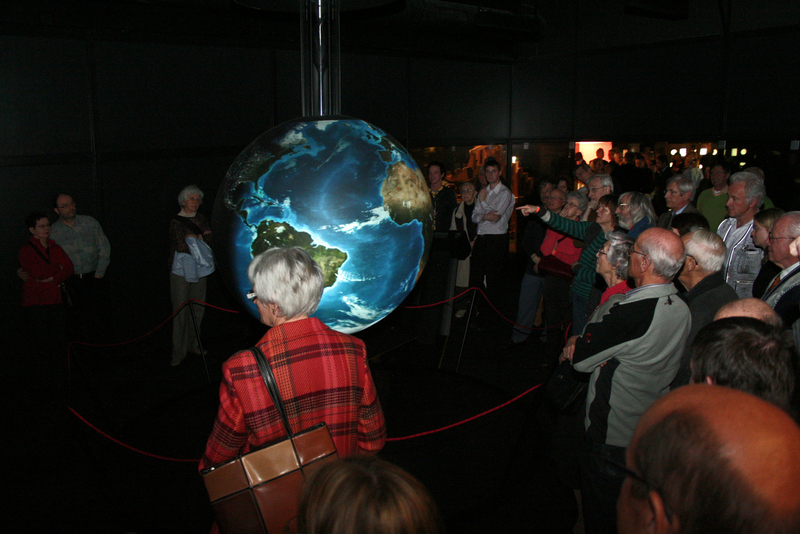 The presentation Planet Earth - Cosmical Oasis is the current demonstration in the Orbitarium. 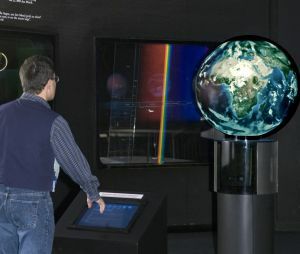 The OmniGlobe is hovering in front of a panoramic screen that represents the cosmos in the exhibition room. 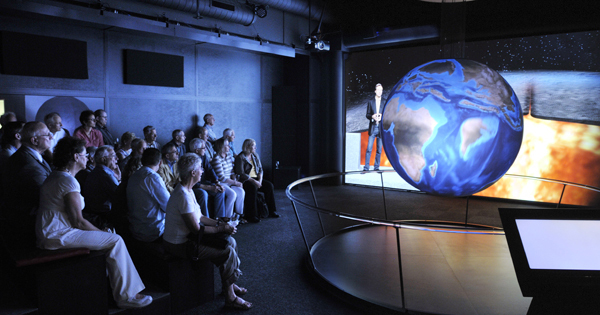 On the globe changes are simulated that have shaped the surface of the earth over billions of years, while in the background the moderator takes the visitor on a journey through the most important stages of development of the universe and the earth. 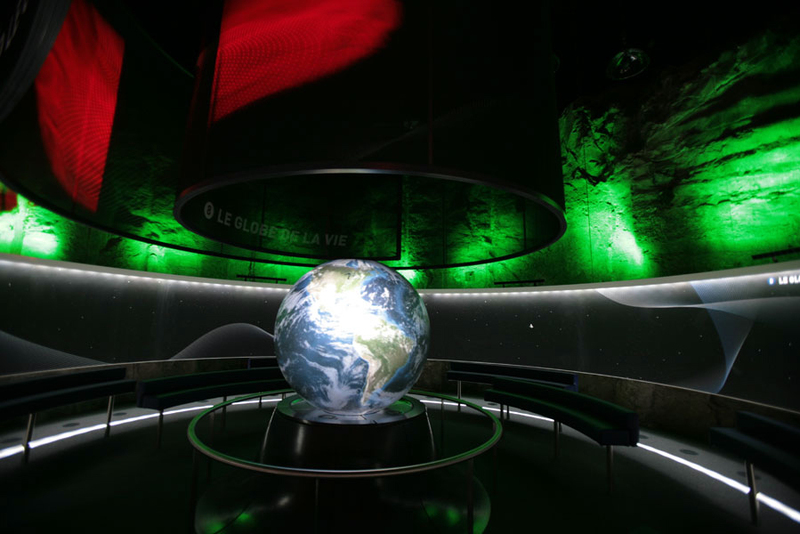 The system involves four video projectors that project animated images of the Earth's surface, oceans, atmosphere and astronomy onto the white surface of a large sphere. 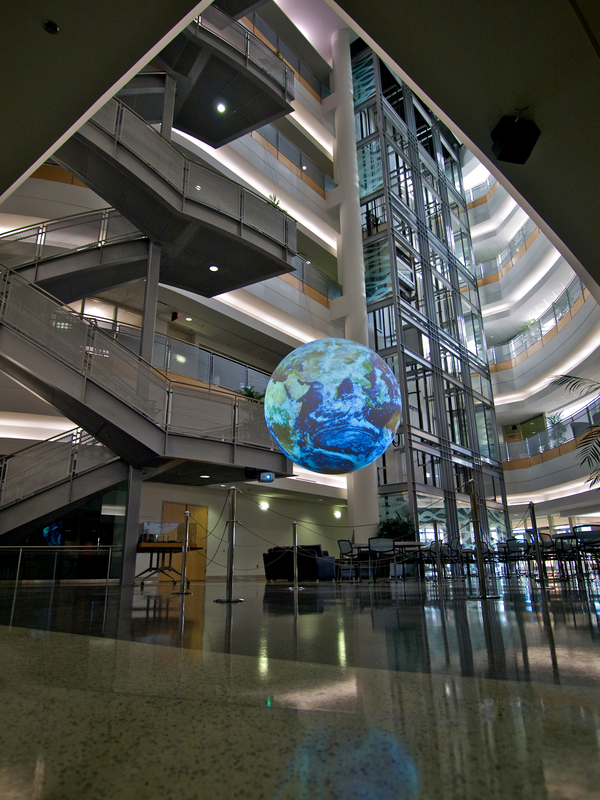 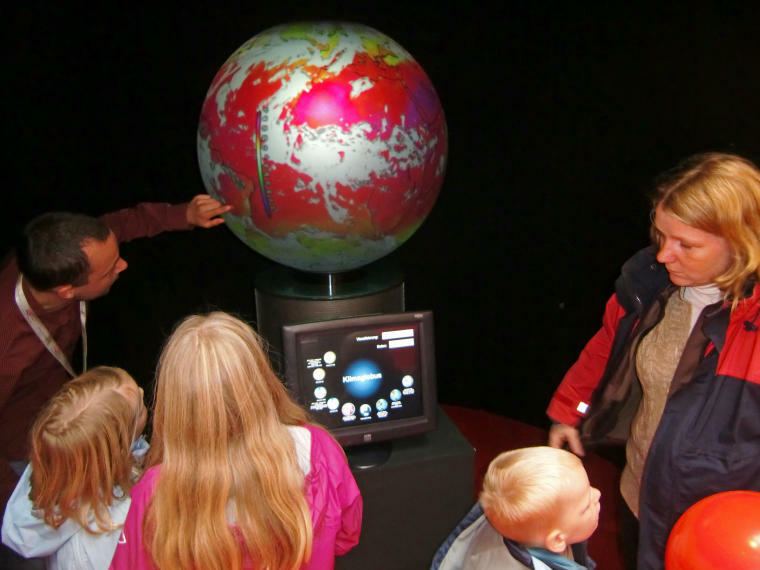 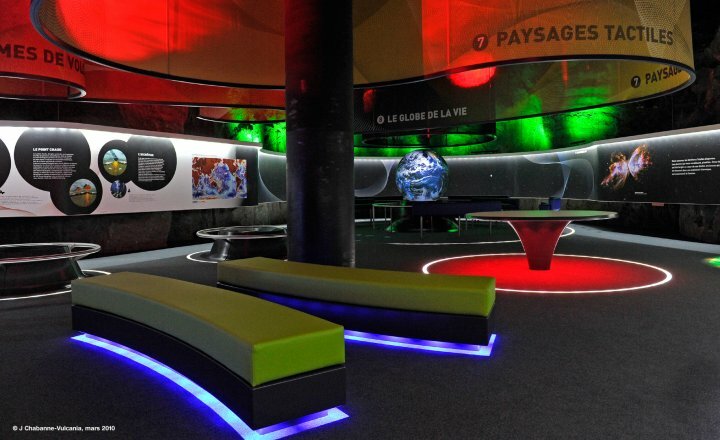 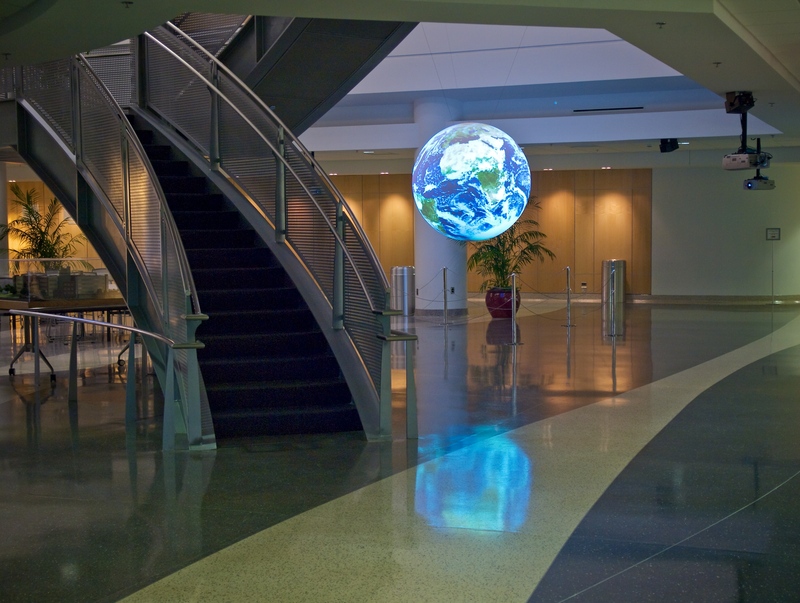 The OmniGlobe® is part of the Weather Zone of the VilVite Science Center in Bergen (Norway). 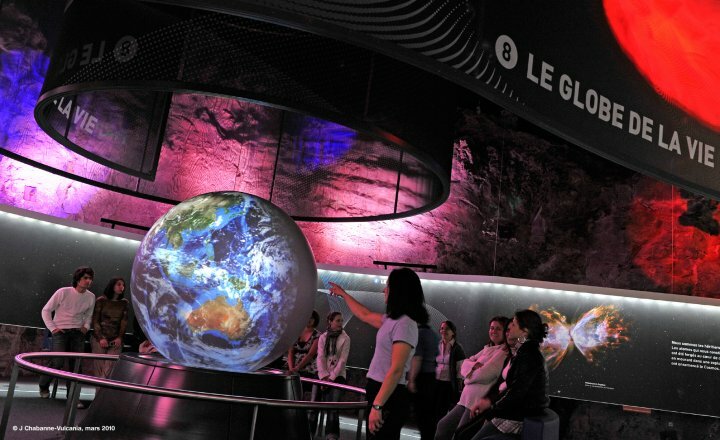 Tellus is a big planet where visitors can study the earth's geology, history and climate and weather phenomena. 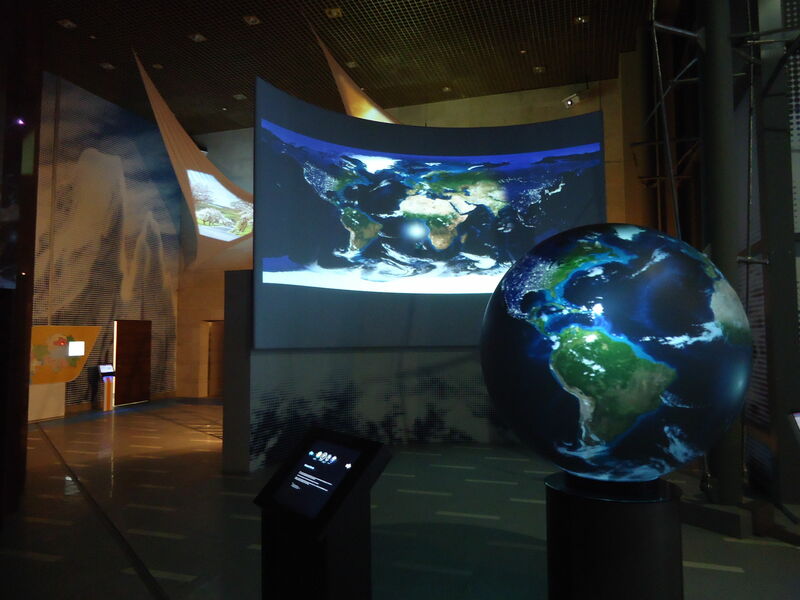 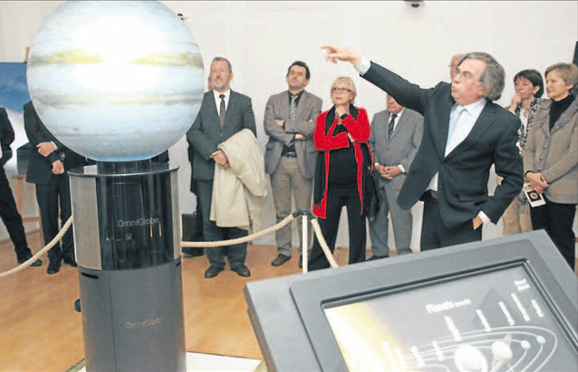 The first OmniGlobe® on the Canary Islands shows the many possibilities of digital projections of visible phenomena of planetary scales, speeds time up to understand changes of our planet and reflects the diversity of planets, stars and moons that populate our universe. 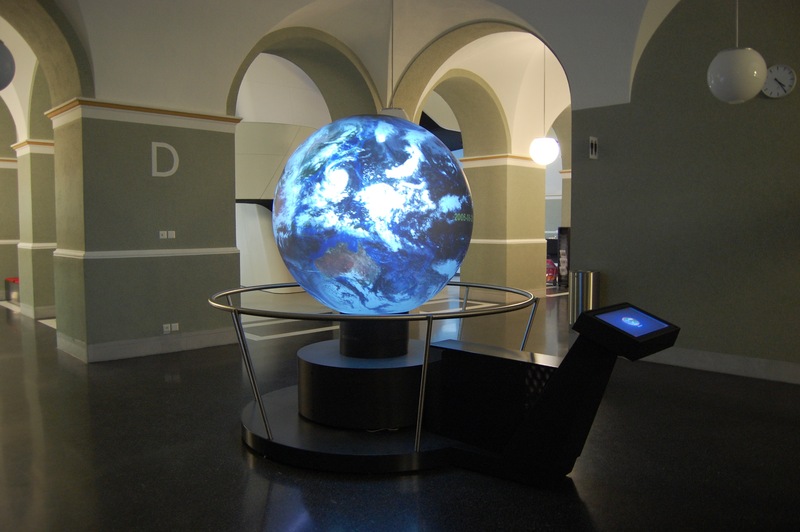 The OmniGlobe at the Deutsches Museum in Munich is part of the exhibition on astronautics. 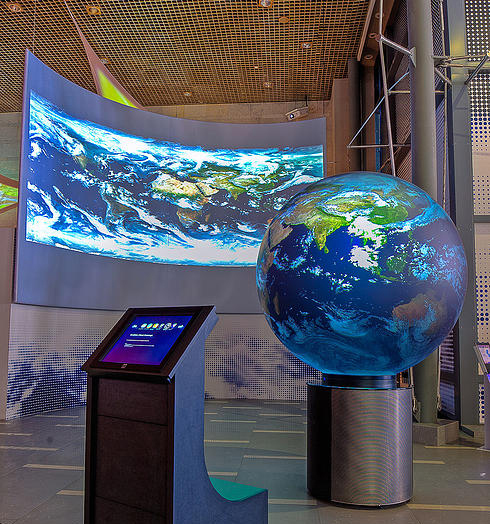 Visitors can choose between different stories like Natural Earth, Occurance of Lightnings, Global Warming, El Niño Effect and La Niña Effect. 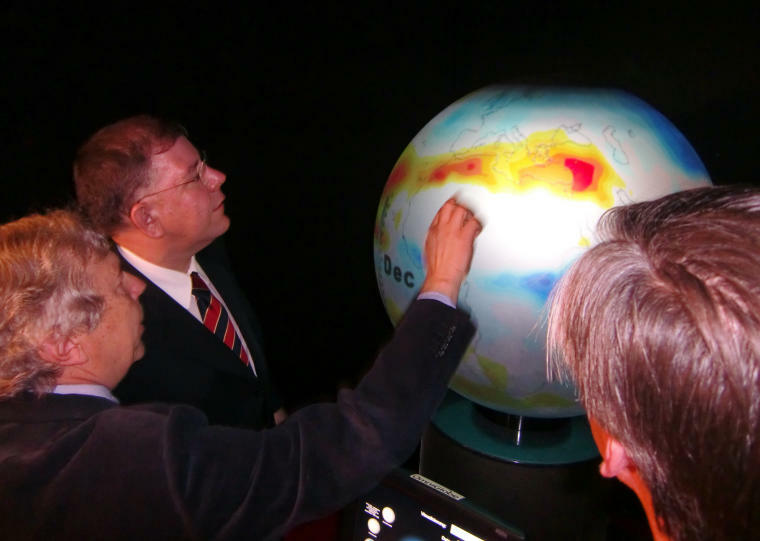 For a story about the Current Global Weather they use hourly updated satellite images from EUMETSAT coming from their own receiving station. 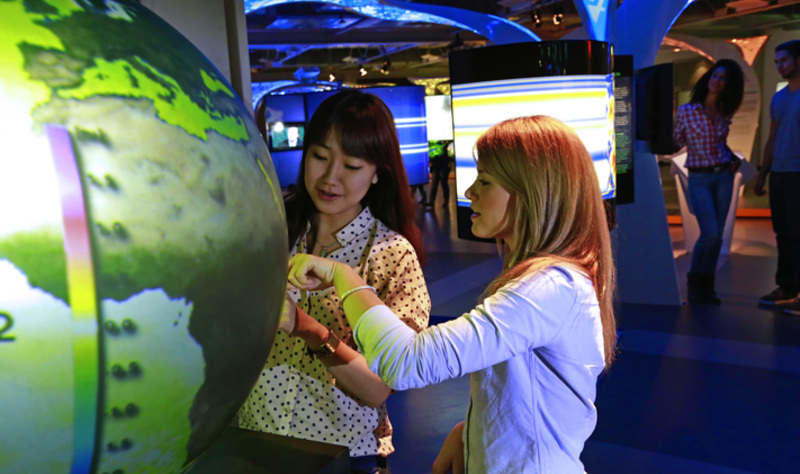 is a place to develop the creative, scientific and educational potential of young Kazakhstan citizens. 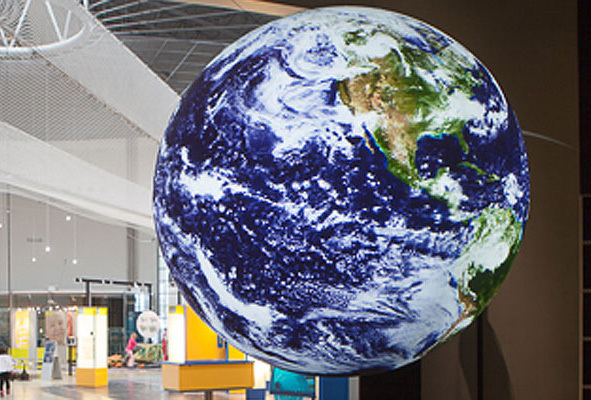 It presents 80 exhibits and interactive displays in all areas of science, technology, sports and the arts with a total area of 1400 square meters. 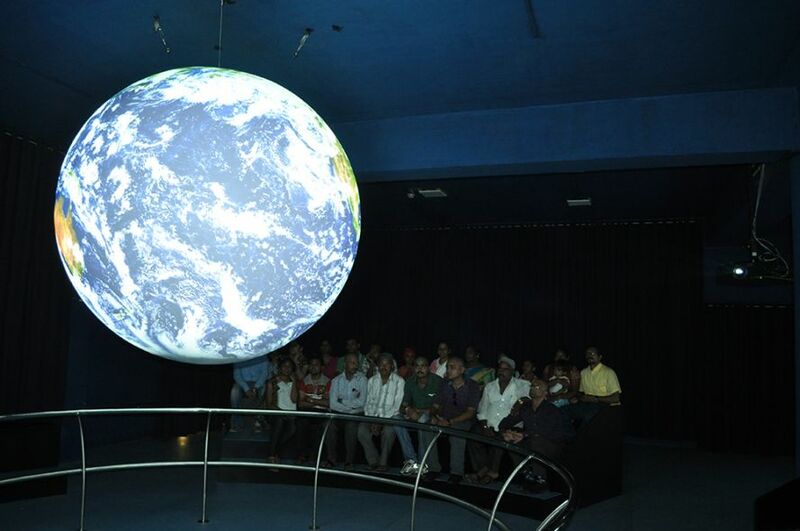 The globe adds as another education and outreach tool of the museum in Bangalore, India. 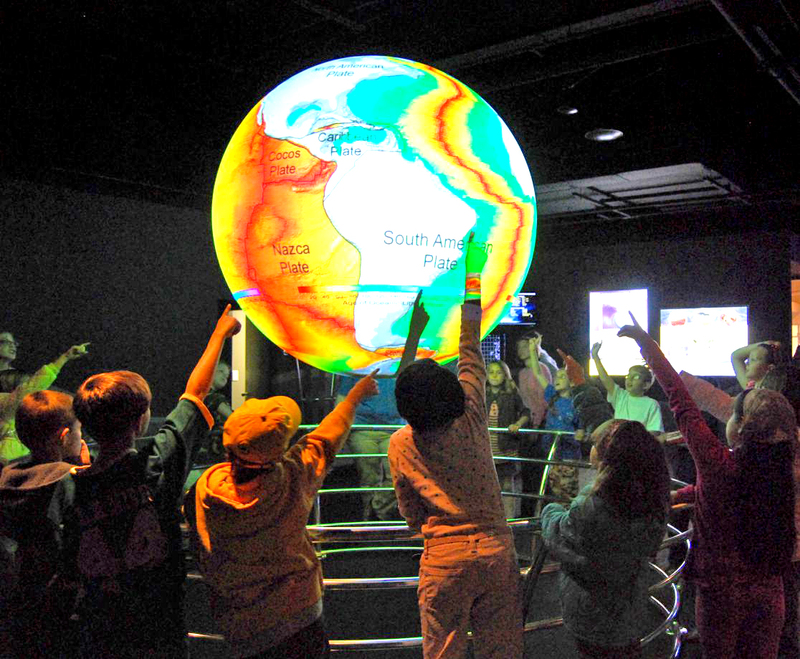 Combined with narration and supporting material it is an innovative and powerful teaching tool to enhance informal education on earth, climate change etc. 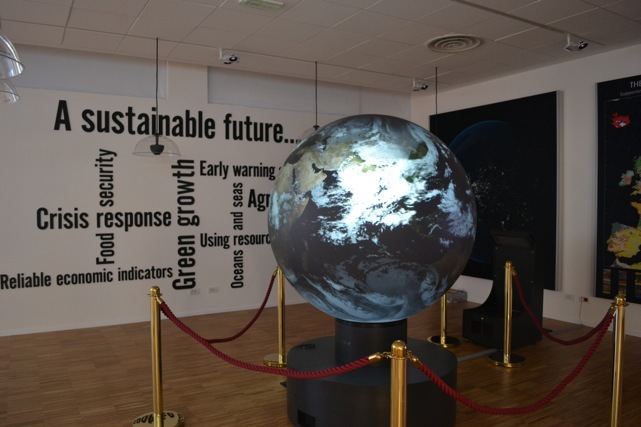 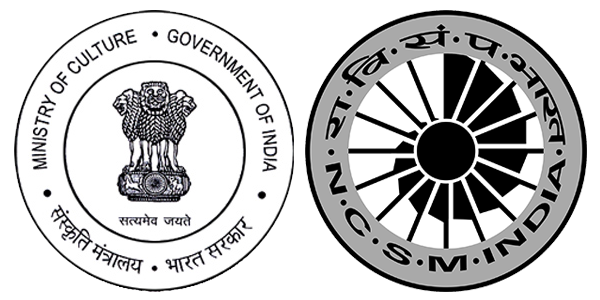 and transform the public perception to effectively implement conservation measures of the earth. 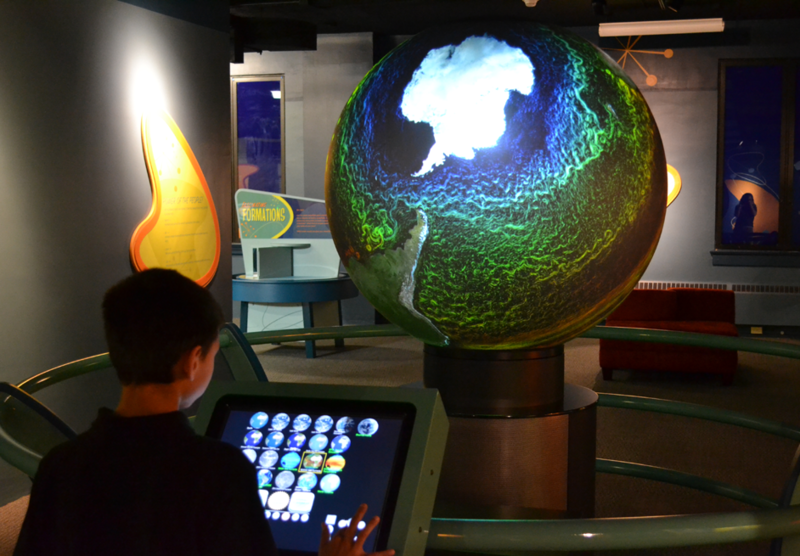 The great globe of life: Life on Earth is the result of an "improbable alchemy" made possible by the precise position of our planet in the solar system. 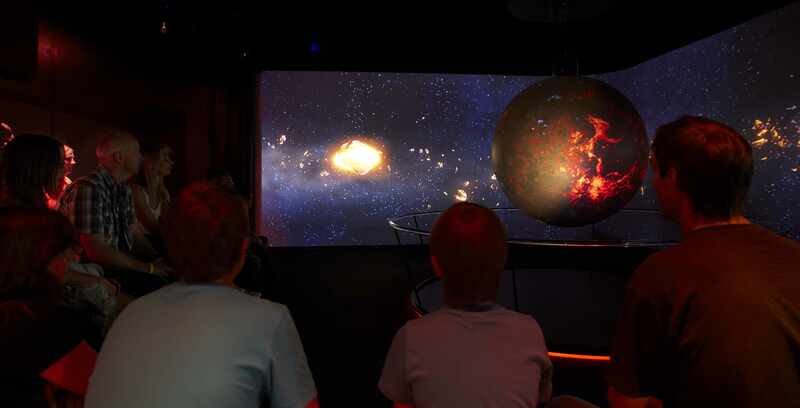 Vulcania’s unique projection on a spherical screen with a diameter of 1.6 m allows you to learn all about the extraordinary adventure of how life first appeared and developed on Earth. 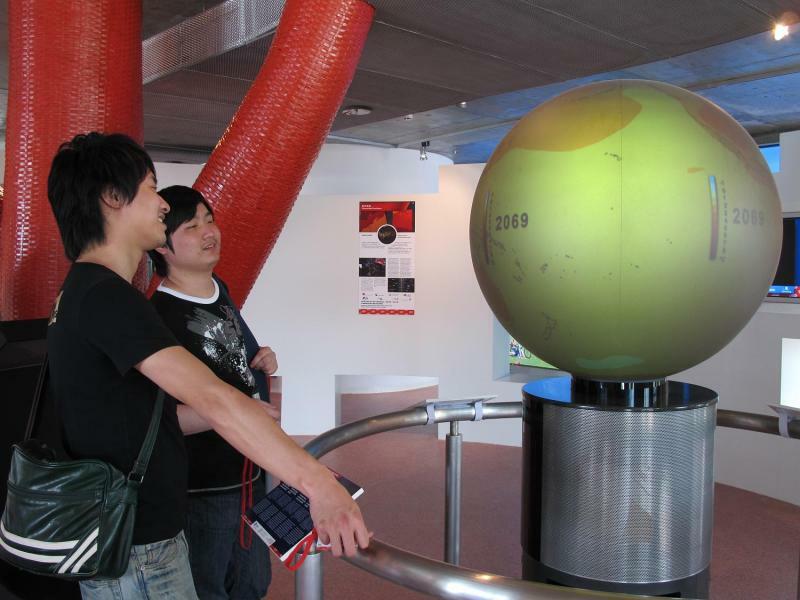 As the first public observatory in Germany, the astronomical observatory in Reutlingen uses the globe to present planets and other celestial bodies of our solar system.